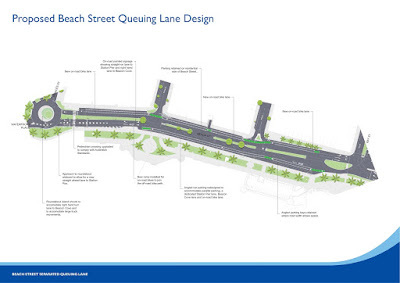 On 28 June 2016, the City of Port Phillip endorsed the refined design of the Beach Street Queuing Lane. A PDF of this plan can be downloaded here. The tender to complete construction will be released to the public this weekend. It is anticipated the successful contractor will begin work in September, subject to delivering the project within a six week time frame. In addition lighting assets along Beach Street must be relocated within this timeframe by CitiPower. If these timeframes cannot be met, construction will commence in May 2017 to accommodate the cruise ship season. More information is available at www.portphillip.vic.gov.au/queuing-lane.htm.